It did get pretty darn hot outside on Sunday. I was pouring beer under the tent in the parking lot from noon to 4 PM, and there were not many people out there braving the heat. Most people stayed inside the shop, where there was more room than at previous Beermongers events because they rearranged the floorplan recently to make better use of the space. I understand that attendance was bigger on Saturday, the first day of the festival. Keep an eye on Upright's lagers. They don't get as much play as the farmhouse lineup, but they fill a gap in town for crisp but tasty German-style lagers. The smoked ones have the typical off-the-wall Upright creativity -- they smoke the malt themselves. Alex told me yesterday that the malt for Gunslinger was smoked over maple and fir, and some of the maple was from leftovers from construction of the bar at his joint venture Grain and Gristle. That would be cool, to sit at the bar and drink the wood from it at the same time. Beetje turned in another simple but effective winner with En Vat. It's recognizable to fans of farmhouse ales, but still approachable to novices. The wine-barrel aging added a nice fruit touch to the palate. And speaking of Belgian styles, the Stone Belgian Barleywine surprised me in the way it was able to combine the best flavors of the yeast with a muscular, hoppy barleywine. I wasn't crazy about their Belgo Imperial Stout -- though I know a lot of people who loved it -- but the b-wine worked really well. Angelo has some pictures up from Saturday at the Brewfest. Kegs weren't emptying out much at the festival, so keep an eye on the Beermongers taplist for the next couple weeks. A lot of impressive beer that was left waiting in the wings is sure to be showing up. Personally, it was the $. 7 tasting tickets = $7, ok done. That leaves tasting glass + admission = $8. Do I want to pay $8 for yet another souvenir tasting glass that I'm going to either have to cram into my overstuffed cabinet or just throw away? No. I recognize that festival costs need to be recouped, so I would much prefer a BYO glass option with a small admission fee. Maybe $2 or $3 for the cause. The fest would have had at least one additional attendee on Sunday with that option. Unfortunately for me, I was just plain busy and injured so though I wanted to attend, I couldn't make the time. Still, I'm glad they're doing so well! Walker: these were actually some very nice glasses (you know, made of glass). I'll be happy to keep drinking beer from it at home. A combination of reasons not to go. 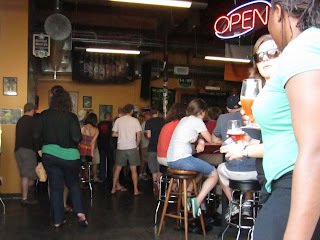 Mostly the heat - just didn't feel like hanging around outside sampling beers in that kind of heat. I didn't realize part of the fest was indoors. Even if it were cooler, beer fest fatigue is definitely a factor. Maybe it's psychological, but a $15 entry makes it a "real" fest - one to plan to go to and spend some time, rather than one to drop by and try a few things. I think it's probably a combination of what other people are saying. I didn't make it over, but I thought about it. Like Walker, I didn't like the price. I also don't need another tasting glass for the bulging cabinet. It's an unnecessary expense. The hot weather probably didn't help. But I think the beer event scene is spinning out of control in Portland. There are multiple events going on every week and weekend. I can't keep track any more, so I don't try. Beer fatigue is a real. I love having choices, but it's a little ridiculous. For me it was the heat. I actually had some time this weekend to head over there, but it was way too hot. @sharon: Wow, if msubulldog didn't attend a festival that was basically a big BA event, that spells trouble right there. Here's a question for you guys who said price was a barrier: Did you go to the Mighty Mites festival a couple weekends ago? It was also held on a very warm day, with similar parking constraints, but you could bring your own tasting mug or get a compostable for free, and buy $1 taster tickets with no entrance fee. I worked the fest as well, and was surprised by the number of people in the neighborhood who didn't know about it and seemed surprised. I'm going with lack of proper advertising. I also don't think Beermongers is known for being a liberal user of AC, so maybe there's that. $15 is pretty standard for a beerfest. I didn't make it this weekend, though my reasons were idiosyncratic and not particularly illuminating. On a personal note, though, I do feel some fatigue with special events--though I'm not proud of it. We enjoy an embarrassment of riches, but that means we have to pick and choose our events. Part of it is that fests take a lot out of me--high alcohol rates, lots of beer. And part of it is that we do have so many opportunities to have exceptional beer that I don't feel the hook to see every event. Again, not proud, but there it is. make that fantasy a reality. What are you guys talking about? I went both days, and had every beer. Beermongers! I agree that there could be some beer fatigue, plus plenty of competition, both within and outside of the beer world we live in. I don't feel the price of admission was a problem, especially knowing that there would be a GLASS glass. Moving here from MN over a year ago, I was shocked that festival would even consider, much less actually use plastic glasses. Drinking quality beer out of plastic degrades the experience considerably. I hope Josh, Sean, all involved don't get too upset about the turnout. It's a first go around and a well done one at that.